In January 2014, a salvage excavation was conducted at Ibthan (North; Permit No. A-6985; map ref. 204848–77/696928–62), prior to construction activity. The excavation, undertaken on behalf of the Israel Antiquities Authority and financed by Zuhadi Abu Raqiya, was directed by D. Masarwa, with the assistance of Y. Amrani (administration), C. Ben-Ari (GPS), P. Gendelman (pottery reading) and M. Shuiskaya (pottery drawing). The excavation was conducted along the southeastern fringes of the site. 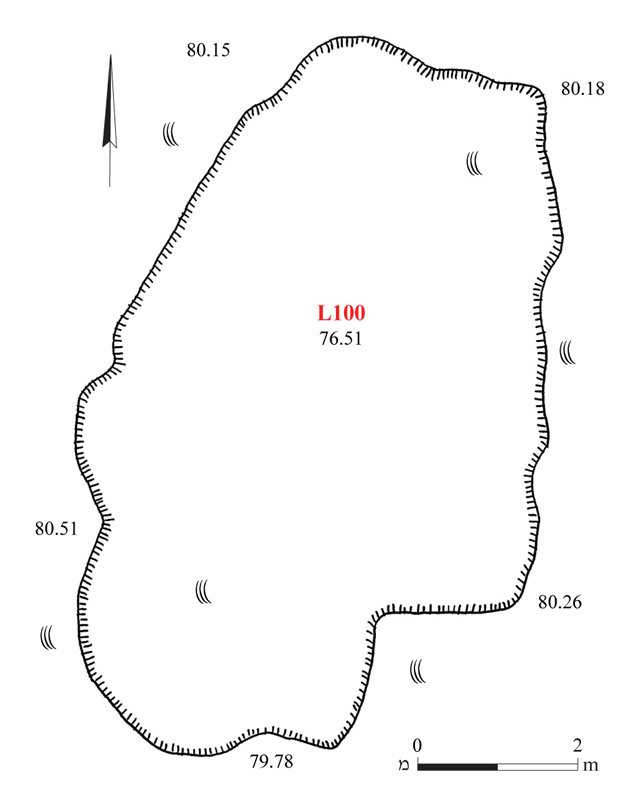 To date, only small-scale excavations were carried out at Ibthan (e.g., Masarwa 2012; Masarwa 2014a). Remains of two buildings dating to the Roman period were exposed in a nearby excavation (Masarwa 2014b). The current excavation was carried out by means of mechanical equipment. 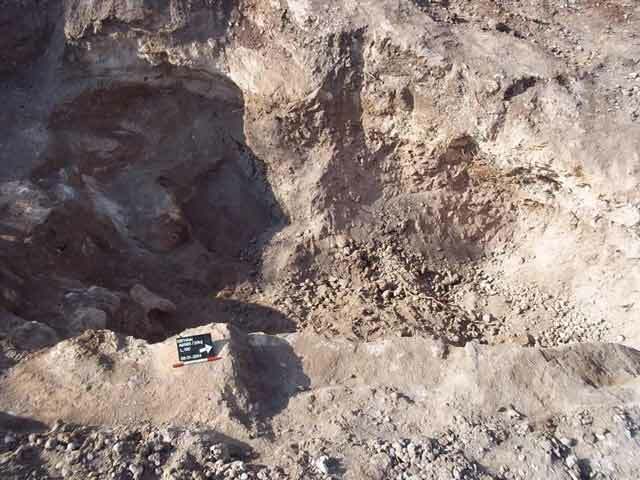 A large pit (L100; 6.0 × 8.8 m, exposed depth 4 m; Figs. 1, 2) was revealed in the bedrock. No signs of hewing were detected; thus, the pit was apparently natural. An accumulation of brown soil, small fieldstones and numerous pottery sherds dating to the Late Hellenistic and Early Roman periods filled the pit. The Late Hellenistic ceramic finds comprise casseroles (Fig. 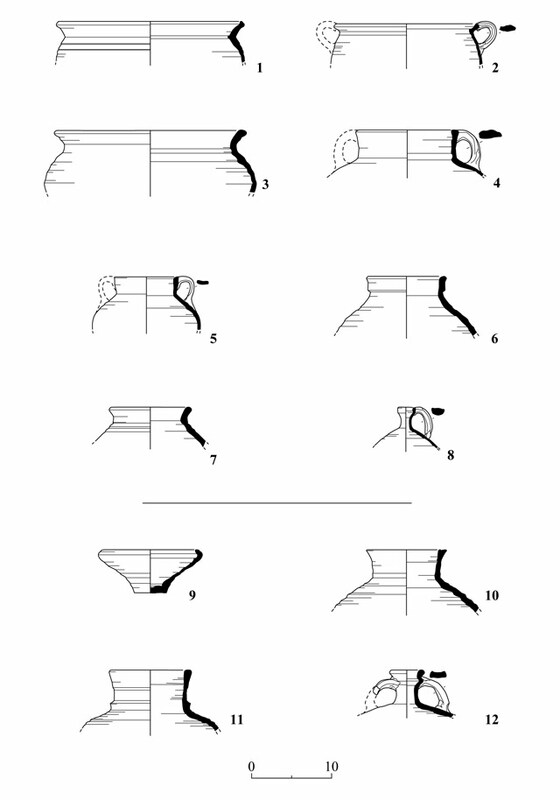 3:1–3), cooking pots (Fig. 3:4, 5), jars (Fig. 3:6, 7) and a jug (Fig. 3:8). The Early Roman ceramic finds comprise a bowl (Fig. 3:9), jars (Fig. 3:10, 11) and a flask (Fig. 3:12). The pit was evidently used as a refuse dump. Masarwa D. 2012. Ibthan. HA-ESI 124. Masarwa D. 2014a. Ibthan. HA-ESI 126. Masarwa D. 2014b. Ibthan North (B). HA-ESI 126. 2. The pit, looking west.